When a person's discs are too badly damaged to be repaired by a discectomy or similar procedure, the surgeon would in the past perform a disc fusion. This involves the removal of the damaged disc and the two adjoining vertebrae being joined together using plates, pins, and/or bone grafting. This will usually eliminate the pain but it also limits the mobility of the patient. For many years joint replacement has been common and is now considered by many as a routine operation. Disc replacement surgery is not too dissimilar. The advances in surgical procedures, medical technology, and engineering have worked together to make disc replacement surgery a viable alternative to disc fusion. A person undergoing disc replacement surgery has the entire damaged disc removed. In its place an artificial disc is inserted. This restores the normal spacing between the vertebrae as well as spinal mobility. It is a very invasive procedure since the entire affected area is exposed. The artificial disc is composed of three parts: two outer metal plates and an inner plastic core. Disc replacement surgery covers both lumbar and cervical regions of the spine. The artificial disc is made from the same materials as other artificial joints like knees or hips. Thus the risk of rejection is minimised significantly. They are also constructed to allow natural bone to bond with it. 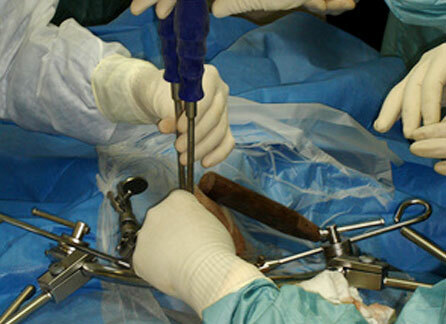 Disc replacement surgery is performed under general anaesthesia. For cervical disc replacement surgery, the surgeon performs the same access procedure as for a herniated discectomy. For lumbar disc replacement surgery access to the spine is through the abdomen. Because there are major blood vessels in the area which must be moved and protected a vascular surgeon usually assists. By going through the abdomen the surgeon has to be careful moving around the other abdominal organs and tissues. Once the damaged area is exposed the surgeon removes the damaged disc. The artificial disc is then inserted into the space and adjusted to fit. The patient is then sewn closed and sent to recovery. This may last for 2-4 days depending on the individual. Once released from the hospital the patient will undergo a rehabilitation programme similar to other disc surgery. Disc replacement surgery is available through NHS. A person recommended for this procedure will follow the standard NHS hospitalisation procedures. There are also a number of private hospitals offering the procedure however it can be very expensive. Though it is preferred to request a quote from a particular hospital, patients have reported total costs over £20,000. In part this is because there are two specialist surgeons involved, a spinal surgeon and a vascular surgeon. Medical insurance should be checked to ensure the procedure is covered. For those suffering from chronic back pain due to a damaged disc, disc replacement surgery offers a viable solution over spinal fusion surgery. There are naturally greater risks with such an invasive surgery, but they are not a normal occurrence. The benefits of having normal spinal mobility and relief from back pain are enough to convince people to use disc replacement surgery.